Intelligent circuitry makes the lights turn on when lifted from the charging base, and start to recharge as soon as they're put back so they're always ready and easy to grab in the middle of the night. Plus, the SafeCharge system eliminates exposed electrical contacts, making them safe for inquisitive little hands. I don't know why we haven't talked about Candeloo yet. But, once my daughter is in a "big girl bed" and has a nightstand, I'm going to go get her a Candeloo. I love the idea of reading-by-Candeloo-light. We've used our candeloos (just like the ones pictured) in our nursery since the twins were born (and they are now 16 mos. old). 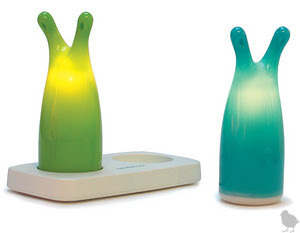 They have two settings for a dim light and slightly brighter one - great for diaper changes and feeding in the night. I'm hoping they will continue to work for us when they eventually make it to their own beds and want a light to carry if they need to get up in the night (hopefully that isn't any day soon! ).